Gosh I love a book that take risks. A book with no title on the cover? Why not? It's SO COOL! So cool, in fact, that I had to remind myself what the book was called before I started this review! Of course, the title is the evocative Penguin Problems, and the title IS on the spine. It's also on the back cover in massive writing, along with the creators (who also appear on a sticker on the front) taking place of the blurb. But who needs blurb when you have this cover!? You're not even going to bother flipping it over to look at the back, you're just going to open it and dive in! And it's so scrumptious inside. We meet a little penguin who is--let's face it--a misery guts. He whinges and moans and sniffles about. It's too cold. Too squawky. Too bright, with too much snow. The water is too salty and he's not bouyant enough. There are too many nasty creatures with big sharp teeth under the water, he's hungry and his flippers ache. Until he meets with wise old walrus. Who tells him a thing or two. And that's when Penguin's problems appear to disappear. He begins to see what the walrus is talking about--and he settles into a quiet sense of awe and appreciation of his world. 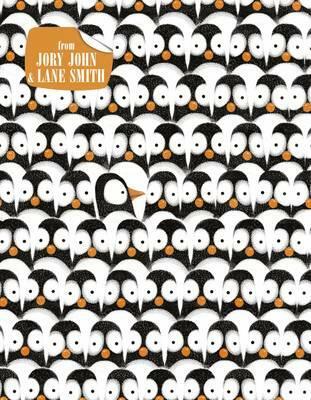 With a brilliant ending, a delightfully wicked 'voice' and inimitable illos by the illustrious Lane Smith, this is an eye-rolling-turned-guffawing tale that kids will get a real kick out of. Perfect for reading in class, and trust me--you'll need to perform an immediate repeat-read.